With a radio, a clock and remote control too! JVC has launched this joint iPod and iPhone speaker dock, to save you the tiresome trouble of having to take one gadget out of a dock and replace it with another. 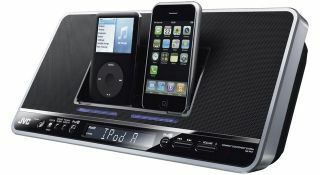 The JVC NX-PN7 will play back your tunes from either of the two Apple devices that you decide to shove into the thing. Alternatively, you might just choose to tune into built-in AM/FM radio (no DAB unfortunately, which is an oversight on JVC's behalf) or make use of the hand video-out socket. It's available now in the US for $150.